The data in LAMP-Nicaragua Database (LAMP-NIC9) were gathered during March - April of 2000 (communities1 and 2), January to March of 2002 (communities 3 through 5), and October to December 2002 (communities 6 through 9). For confidentiality reasons, we preserve community names. 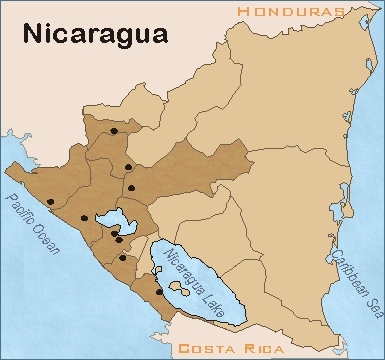 In addition to information on migration to the United States, the Nicaraguan surveys collected data on migration from Nicaragua to neighboring Costa Rica. Consequently, complementary interviews (see Methodology page) were conducted not only in the United States, but in Costa Rica as well. The surveys in Nicaragua were made possible through an association between the LAMP and the Central American Population Center of the University of Costa Rica (click here to find out more) .